It’s hard to not get excited about receiving a tax refund. week ending Feb. 22, according to the IRS. That’s just about on par with last year’s figures, despite the recent downward trend of smaller checks. Of those who expect to receive money back from the government, the majority of those polled plan to pay down debt, GoBankingRates found. “Paying down bad debt with a tax refund could be the ideal decision,” said Austin Winsett, a CPA and wealth advisor at Exencial Wealth Advisors in Frisco, Texas. With consumer debt at a record high, more than 1 in 3 people — or 86 million Americans — now say they are afraid they’ll max out their credit card when making a large purchase, according to a separate survey by WalletHub. 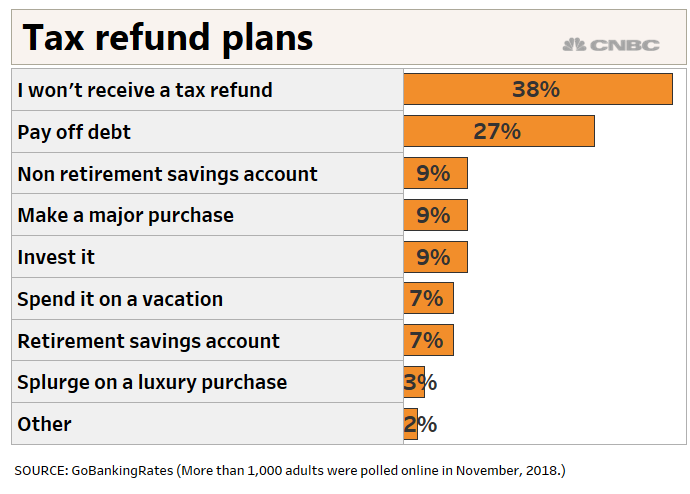 Just about 1 in 10 said they would rather use their refund to invest, make a major purchase on a necessity or stash it in a savings account, GoBankingRates found, and only 7 percent said the money would be put toward retirement. A mere 3 percent planned to splurge on a luxury purchase, down from 5 percent last year. This tax season marks the first time filers are submitting returns under the Tax Cuts and Jobs Act, which slashed individual income tax rates, doubled the standard deduction and eliminated personal exemptions. If you withhold too little, you’ll see more cash in your paycheck in the near term but your refund will be smaller — or you may even owe money to the IRS. On the flip side, “a large refund says that the government just held on to your money through the year, while it could have been producing dividends and interest in your hands instead,” Winsett said. Here’s why getting nothing back from the IRS might be a good thing: Neither owing a balance nor receiving a refund is an indication that you paid exactly the amount of tax liability you owed. In fact, more than one-third of those polled by GoBankingRates are in this boat and are not expecting to get a tax refund at all this year.